Anyone familiar with horror films will recognize the following scenario: a group of people are being terrorised by a monster/serial killer/alien. They find a hiding place and fortify it. All their attention is focused on keeping the intruder out. Not until it’s too late do they discover that the monster is already inside the building. There is something of this trope in the response of the UK public to the political horror film starring the orange-haired beast known as Donald J. Trump. Last week a poll revealed that 1 in 10 people would be willing to protest against a putative ‘working visit’ from Donald Trump next year on a date that has yet to be determined. It is still not certain that this visit is even going to take place. Yet already the community networks that helped organise last February’s Stop Trump/Stand Up to Trump protests are bracing themselves for the occasion and putting dates into their diaries. On one level this response is admirable. It’s a healthy sign that so many people are willing to disregard the grovelling decision by May and her hapless cronies to invite Trump anywhere near these shores. But we should not allow the beast in the White House to distract us from our own political monsters already in our midst. Because like Godot, Trump may not come. And as far as migrants in the UK are concerned, Trump is by no means the most pressing threat that this country faces right now. On the contrary, for the past eighteen months the lives and futures of 4.4 million people have been placed in limbo as a result of Brexit – and more particularly by the stunningly cynical decision of our own government to use EU citizens as bargaining chips in its cack-handed negotiations with the European Union. Right now, the UK government is implementing a ‘hostile environment’ policy, which is intended to strip ‘illegal immigrants’ of the basic components of survival in a modern society, from healthcare, driving licenses, bank accounts, to the right to rent a place to live. Until it was declared illegal by the High Court last week, this policy was extended to include EU citizens — who are not technically ‘illegal’— have become homeless. Last week, a Polish man who reported to the police that he and his wife had been terrorised by their landlord was arrested and placed in detention prior to deportation. Last week the Nigerian boxer Bilal Fawaz, who once boxed for England, was told he would be deported. Two weeks ago, the Home Office told a Jamaican woman who has been living here for fifty years that she would have to return to her “own” country. Every week — indeed, almost every day — the Home Office makes ‘mistakes’ like this. The UK is unique in Europe in that it has a policy of unlimited detention. According to the Children’s Commissioner for England, some 15,000 children are permanently separated from their parents as members of “Skype families” — as a result of being subjected to the arbitrary income thresholds imposed on married couples by the UK government. The vicious treatment of migrants by the British state is, to some extent, a product of a more general hostility towards immigrants and immigration that has become powerfully embedded in the British media, the public and the political class, and which reached a dismal apotheosis in the Brexit referendum. You will have to look a long way to find much condemnation of these developments by British politicians. Even the Labour Party in its current, more leftist, incarnation, has largely kept a distance from the May government’s scandalous refusal to guarantee the rights of EU nationals, fearful as it still is of being seen as ‘soft’ on immigration or unresponsive to those famous ‘concerns’ on which Labour believes its political future will be decided. Indeed, Corbyn and his circle often appear alarmingly willing to accept arguments from the ‘Lexit’ left, not only in regards to the EU’s supposedly ‘hardwired neoliberalism’, but also in respect to migrants and migration. A significant section of the Labour movement continues to regard EU migrants as a problem, to be dealt with by restricting or even rescinding the free movement of people — one of the great progressive achievements of the European Union — regardless of the fact that labour exploitation of migrant workers is liable to be easier without free movement. One section of the left — most notably represented by the Communist Party and Trade Unionists Against the EU, an organisation part-funded by Arron Banks — continues to depict migrants as if they were little more than vapid commodities shifted from one country to another by ‘the bosses’ — an argument that in its worst incarnations, dovetails neatly with the UKIP narrative of a culturally beleaguered (white) working class marginalised in its own heartland by the neoliberal bureaucrats in Brussels. We shouldn’t be entirely surprised by this. Trump and Trumpism are products of many of the same political forces that were instrumental in driving Brexit: ethnonationalism, anti-immigrationism, xenophobia, nostalgia for a vanished ‘greatness’, cultural anxieties about national identity and loss of white status, and outright racism, a populist rage against ‘elites’ that has too easily emboldened and legitimised the exclusion, persecution and ‘othering’ of foreigners – or people who ‘look like’ foreigners. All these forces were present during the referendum and have continued to course alarmingly through our body politic. It’s not for nothing that Trump and even his failed nominee Judge Roy Moore have praised Brexit, or that Arron Banks and Nigel Farage rushed off to Trump Towers within weeks of Trump’s election, or that Farage has campaigned for Moore and idolizes Steve Bannon. These are all chips off the same old bloc, lubricating fake revolts against the ‘ establishment’ by stoking a steady drip-drip of hatred — whether directed at Muslims. immigrants or foreigners — and we should not need Trump to remind us of their existence. Many UK opponents of Trump have rightly condemned the violence and the potential for violence in Trump’s rhetoric and in the actions of some of his supporters. But over here, we have had an MP shot dead as a ‘traitor’ by a follower of the same movement whose videos Trump has just retweeted. We have regular death threats directed against any prominent figure who appears to be getting in the way of Brexit — or who even has the temerity to suggest that Brexit should be subjected to parliamentary scrutiny. When that person happens to be a woman — and a woman of colour at that, as is the case with Gina Miller — such threats come marinated in a savage mixture of sexism and racism. Yet when Miller revealed a few months ago that she was thinking of leaving the country because of the threats made against her family, no major political figure saw fit to denounce this state of affairs. Arron Banks, the architect of Leave.eu, even joked about it. Such tendencies are not entirely new. Racists may feel emboldened by the referendum, but they were not created by it. Only today, Bristol police and town council were accused by the Safer Bristol Partnership (SBP) of ‘institutional racism’ for the way they responded to the horrific murder of Iranian refugee Bidram Ebrahimi, who was beaten to death in 2013 after being wrongly suspected of paedophilia. Once again, we should not need a ‘working visit’ from Donald Trump to galvanise us to act in response to these developments. Yet Trump’s grotesque barbarity often seems to eclipse the everyday barbarities that have become part and parcel of the post-referendum UK. As one of the organisers of the 1 Day Without Us campaign in solidarity with UK migrants, I’ve seen how difficult it is to persuade people to stand up alongside the migrants who are already here. When we organised our first day of action, last February, the Stop Trump campaign declared its own ‘Day of Action’ on the same day. To their credit, the organisers of the campaign went to great lengths to highlight at their event the issues we were already raising, and to include them within their own anti-Trump message. But it should not have needed Donald Trump to bring this about, and the UK’s shameful treatment of migrants should not be added as an afterthought. Next year we are planning another day of action around the slogan ‘Proud to be a migrant/Proud to stand with migrants.’ We are asking people to join us – not just to ‘Stop Trump’ but to stand with and for the migrants who live in our communities across the country. We are asking them to help us reclaim the word ‘migrant’ from the debased coinage that it has become in UK political discourse, and turn it into a source of pride. In the face of ever-more strident demands from the ethnonationalist right for a monocultural, migrant-free UK, we are asking the public to celebrate and embrace the society that the UK has become – diverse, open, multicultural and multi-ethnic. 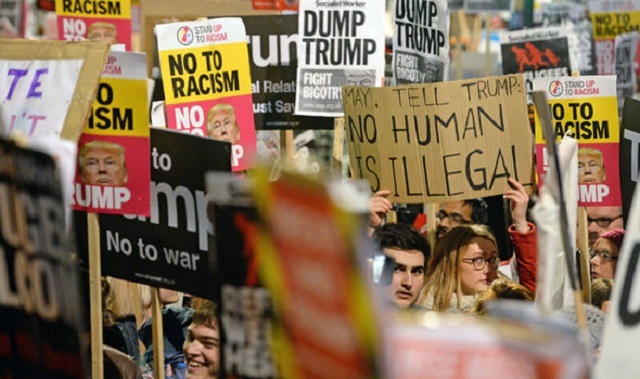 If Trump is foolish enough to come to the UK, by all means let’s see hundreds of thousands of people in the streets to say that we reject his politics. But it’s worth remembering that when he has gone, this country will be the same as it was before. And, right now, as we scan the horizon for the monster who may or may not come shambling towards us, we ought to bear in mind that we have our own monsters to fight, that many people are threatened by them, and that our solidarity will always be incomplete until we stand with them.